The MBL consists of high-resolution images and databases of brains from many genetically characterized strains of mice. "There are numerous uses of the MBL, but our own mission is to systematically map and characterize genes that modulate architecture of the mammalian CNS (for a complete description of our projects refer to our P20 Human Brain Project award: Informatics Center for Mouse Neurogenetics)." Search the library. View labeled high-resolution cross-sections of mouse brains. Also we include a tutorial that gives detailed instructions for creating your own mouse brain atlas. A key challenge is how to deliver massive image collections such as the MBL, Allen Brain Atlas projects, and BrainMaps using modern web services. In this work we tested Microsoft Live Labs Pivot (www.getpivot.com) as an image distribution portal. Pivot provides a unique method for delivering and exploring very large collections of high-resolution images. If you would like to experiment with Pivot collection in your preference browser, Microsoft Silverlight is required. Get Silverlight Now. Read abstract on Neuro Informatics 2010: "Global Exploratory Analysis of Massive Neuroimaging Collections using Microsoft Live Labs Pivot and Silverlight." 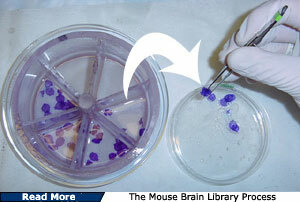 to provide online realtime access to the slides which form the Mouse Brain Library. Secure user authentication and scheduling ensures reliable, responsive access to the system. Mouse Brain Library Training Manual Training Manual - Detailed Protocol Mouse Brain Atlas Tutorial Information, images, and HTML for creating an atlas of your own MBL Slide Library Tutorial Step-by-step instructions for creating a slide database in FileMaker." Browse or search the Mouse Brain Library (MBL). The library contains high resolutions images (3060 x 2036 pixels, 25 µm per pixel) of individual slides, usually two per case. We are in the process of acquiring images for more than 1500 cases, usually 8 cases per strain cut in either the horizontal or coronal planes. All sections are currently 30 µm-thick sections stained with cresyl violet (an analine dye that preferentially stains RNA and DNA). Over 800 cases are now available. This manual explains the process of embedding brain tissue in 12% celloidin, cutting the tissue with a microtome, staining and coverslipping the brain sections, the images of which are then posted on the internet for research purposes. Mouse Optic Nerve Image Database (MONID) A collection of high magnification electron micrographs of the mouse optic nerve suitable for quantitative, comparative, and genetic analysis. View imaged micrograph sets. The iScope Client SoftwareAs of Gumbo v2.7 and Aria3D v1.5, these two components of the iScope Client now feature more integration - specifically the ability to launch Aria3D from within Gumbo. Click here to download software, and learn more. MoviesSeries of brain images, microscope focus-through movies, and other movies in Quick Time format. Click here to see the Cell Identification Movie. NIMH, and NIAAA (P20-DA 21131).